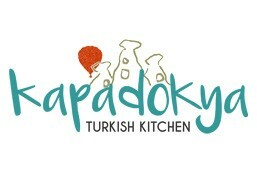 Kapadokya Restaurant is currently closed for delivery and it will open at 11:30 AM today . Tasty mixed of diced tomatoes, onion, cucumber, pomegranate, pepper and parsley dressed with lemon juice, olive oil, salt, pepper and sour pomegranate syrup. Combination of rocca leaves, few green olives and tomatoes with mixture of olive oil and pomegranate sauce. Combination of salad ingredients such as tomato, lettuce, parsley, rocca, with olive oil, lemon, pomegranate sauce and special taste of grilled halloumi cheese on top. Appetizer made by breaded kashkaval Cheese and deep fried in oil. Meat döner (wrapped) in a freshly baked Turkish (flat) bread with lettuce and tomato, served with potato. Chicken cubes (wrapped) in a freshly baked Turkish (flat) bread with lettuce and tomato, served with potato. Adana Kebab (wrapped) in a freshly baked Turkish (flat) bread with lettuce, onion and tomato, served with potato. Lamb meat slowly cooked in a traditional Turkish oven. Served boneless and tender with a side of Turkish rice. Breaded Chicken breast stuffed with cheese and Turkish sausage, pan fried until golden brown, served with potato and salads. Our famous doner meat on diced Turkish bread served with traditional tomato sauce and yogurt. A traditional Turkish sweet composed of shreded phylo dough filled with authentic Turkish cheese baked in oven and is served with light syrup. Traditional carrot shaped Turkish dessert composed of thin layers of authentic doughfilled with crashed pistachio on th mid layer.